Did you know that Phone Sound has six (6) state of the art recording studios, designed to produce high quality audio advertisements for your phone lines? That’s right, our head office is home to 6 custom designed and built recording studios, all featuring the very latest and greatest sound proofing methods, recording equipment and editing suites. Our studios are used daily to record thousands of message on hold programs, in fact, you have probably already heard a few already when you have called businesses in your area. 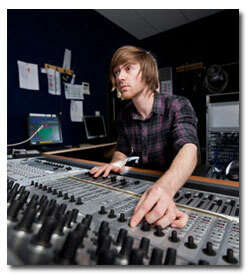 Our audio engineers worked together to design recording studios that are of a very high quality. In fact, we even lease our studios out to other production companies and film productions. So you can be rest assured that when you sign up for Phone Sound’s music and messaging on hold to add to your audio marketing, you will be getting a broadcast quality audio production that is scripted, voiced and recording in our in-house recording studios. Call us today for a professional audio production to play to your callers on hold.